Ercall cottage is a twin unit, two bedroomed, self catering accommodation in the Stiperstones area of Shropshire. It has a warm and cosy feel with a contemporary twist. This cosy, timber built chalet occupies a peaceful, picturesque setting nestling in an unspoilt valley on the lower slopes of the Stiperstones, a designated area of outstanding natural beauty (AONB), approximately 13 miles from Shrewsbury. The Chapel sleeps up-to three very comfortably but has dining space for four, should you wish to entertain visitors. Please note, this is a pet free property. Check-in is from 4pm, please collect your keys from Phil & Lara at The Stiperstones Inn. Check-out is 10am on the morning of your departure, please hand keys to The Stiperstones Inn. Off the hallway, the main living area is a spacious yet cosy room with modern yet comfortable solid oak furniture and is decorated in soft greys and mauve. This cosy room is heated with oil fired radiators and a living flame electric fire for those quiet nights in. There is a flatscreen television with dvd player and a collection of dvds, books, boardgames and jigsaws are available. The dining area is a modern oak table with seating for four people. The spacious master bedroom has a kingsize bed, a suite of matching furniture including, side table with drawers, two bedside cabinets with drawers and a good sized wardrobe. The window affords views of the nearby hills. The room is decorated with soft warm tones. This smaller bedroom has a single bed, a bedside cabinet with drawers and a single wardrobe. The window affords views of the garden and The Stiperstones Inn. The room is decorated with rich warm tones. The adjacent WC and shower room is also equipped with sink and vanity unit with light above. The room is decorated with modern white wall tiles, with modern accent pattern and has a bath with overhead electric shower. This traditional country kitchen with painted hardwood doors, is equipped with everything you will need for your break, plus all you will need for a spot of baking. There is also a selection of cookery books by various authors. The Iron and Ironing board are located next to the waste bin in the tall cupboard. The garden is to the rear of the cottage and is accessed via the front door. There is a swing seating area and the lawn is accessed via concrete steps. This is the perfect place to relax and watch the local bird life. 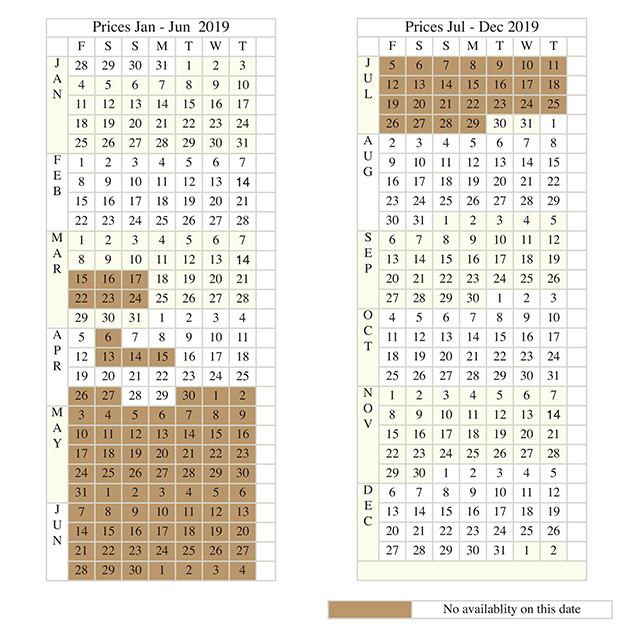 2019 Bookings, Prices to be confirmed (Darker areas are booked).